Big Shoes has nothing at all to do with disruption, nor with the notion of “jobs to be done” marketing. It is a very simplistic idea of niche marketing. Q1: What is being disrupted? A1: Nothing. Lots of shoe stores sell big shoes. They may not be specialized, or have the variety, but it is clearly within the scope of the overall shoe industry. It doesn’t change the business model for selling, making, or delivering shoes. It doesn’t lower the cost, or make it more convenient to get shoes. It has no chance of displacing shoe stores that sell the full range of shoe products. Q2. What unmet need is being served? A2. 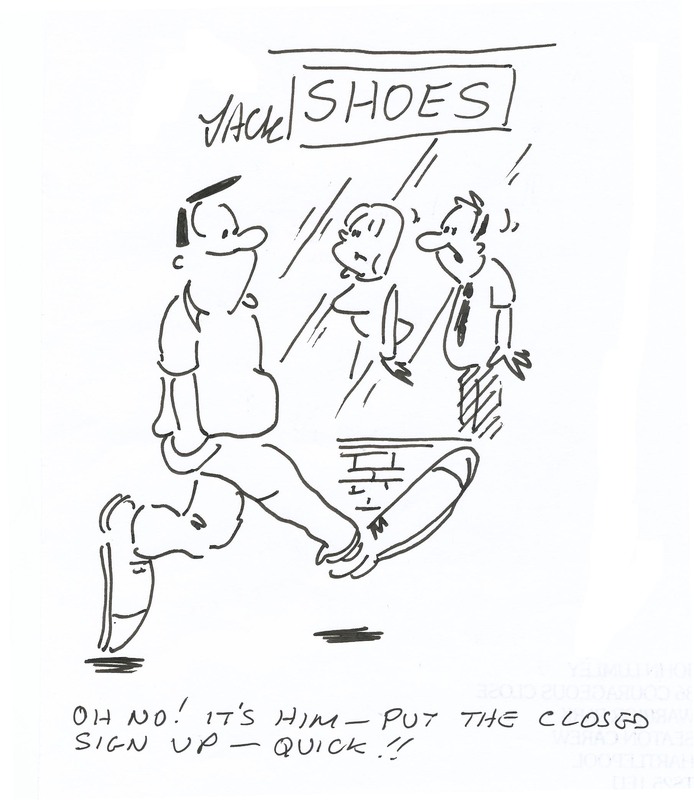 You could possibly argue that it is difficult to find a broad selection of large-sized shoes in standard shoe stores. But, this is a red herring. There is no room for expansion in this market, because as soon as you sell shoes that aren’t big, you aren’t a big shoe store anymore. And, all a regular shoe store has to do, if so inclined, is to slightly improve their selection of big shoes to stop the growth potential of a big shoe chain. A regular shoe store chain has a huge advantage of convenience, as they are selling to a broader market, and therefore will have more stores in more locations. Except for a tiny niche who aren’t satisfied by the range of shoe styles offered, and who are willing to make a special trip to go to a specialty store, there is nothing special this store has to offer that is fundamentally different from a normal shoe store. This is the definition of a niche marketer, not a disruptor. Q3. What is the unique, (non-obvious) “job to be done”? A3. There isn’t one. No matter what size of shoes that a person wears, they are all bought for the same reasons. Foot protection, style, utility (e.g. running shoes). There is no unmet need beyond the product attribute itself — i.e. size. But how is that different than me needing a size 10 and you needing a size 12? Again, all that needs to be done to relegate the big shoes store to a tiny niche is for a shoe emporium to expand their selection. There simply isn’t anything special about people with big feet. The real question is what is the point in labeling these guys as a disruptor? Does it change how they do business? Do they market differently? Is their business strategy fundamentally different from a “shoe store”? My point in challenging this is that for disruption to have any useful meaning, we can’t just apply it as a hype term to describe all innovations, or all niche marketing opportunities, or to relabel the concept of positioning or of segmentation. If we do that, we neuter “disruptive innovation” of all value, and create fuzzy business thinking which doesn’t help solve any real strategic problems. Note that you did mention a disruptor in this article — Zappos is one. But they are disruptive because they change the business model for shoe selling, reducing cost, improving service, and increasing selection in ways that are impossible to duplicate by a regular shoe store, similar to what Amazon did to the traditional bookseller. Also, if you wanted to apply the jobs-t0-be-done concept in this instance, you would be looking for an alternative, probably inferior (on at least one dimension in the eyes of the mainstream market) product which solved some part of the shoe experience better than traditional shoes — perhaps something like environmental sensitivity. For example, maybe an adaptation of socks which sacrificed durability for increased comfort and protection which were intended to be disposed of after just a few wearings, but which were biodegradable. When finished with them, you simply toss in your compostor or bury in your garden as plant food. Then, the job to be done that satisfies an unmet need is solving the end-of-life problem for traditional shoes. That would have potential to be hugely disruptive, if someone could figure out a way to make it work. And, it would even be disruptive for people with big feet. When all is said and done, I do however believe that Big Shoes is case of asymmetric motivation, an important and often overlooked principle of disruptive thinking. One general challenge in addressing disruptive innovations is that its authors have come to state the theory as more or less universal. This makes it even more difficult to categorize a case as disruptive or not. As with Big Shoes and asymmetric motivation, some cases might carry facets of disruption. When talking of Zappos, its distribution channels and service offerings, it might be an interesting discussion whether or not disruption can occur in parts of the business model, e.g. customer segmentation. Relative to competition off course. And if not sustainable, perhaps semi-disruptive. In respect to you comments I change the headline and do an update. Moving forward I’ll make sure that I’m not seeing the trees for the forrest. Thanks. Keep working, I have read two posts and both were very insightful. I am also learning BMG, CustDevep and the like. Have a nice day! I was wondering when shoes are customized with character print, is what is the print is on indeed fabric and if so how is this attached to the shoe. Well information! I agree your post.